This smoothie is filled with colorful fruits and veggies, layered in order of the colors of the rainbow. It is a featured recipe from our Preschool Food Adventure and is also a favorite from our cooking camps. Try this smoothie for a refreshing breakfast or snack. Layer the ingredients in the blender starting with strawberries. 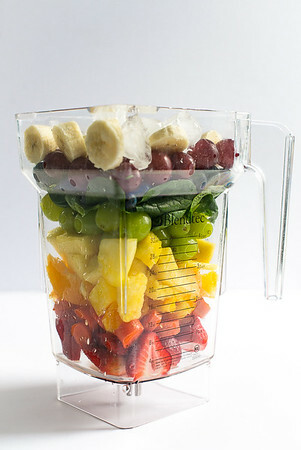 Add orange, carrot, pineapple, green grapes, spinach, blueberries, purple (red) grapes, banana, and ice. Blend until smooth. Smoothies are a great consistency for new eaters and a great way to introduce a colder temperature. So they don't drink the cold smoothie too fast, consider dipping a training spoon into a small cup of puree so that baby can lick the spoon and enjoy the flavor.